REAL ESTATE WILL SELL AT 11 AM SHARP! PERSONAL PROPERTY AUCTION WILL BEGIN AT 10 AM! PROPERTY DESCRIPTION: 3 bedroom 2 bath brick house on 13.27 acres of timber, pasture, and creek. The house was built in 1983, has rural water, and central heat & air. There are 1852 square feet of main floor finished living area and a full unfinished basement. Other buildings include a 24′ x 24′ detached garage, a storage building, and an old machine shop. This property is a great opportunity for both owner occupants and investors. With some updates and repairs, there is a lot of room for increased equity. 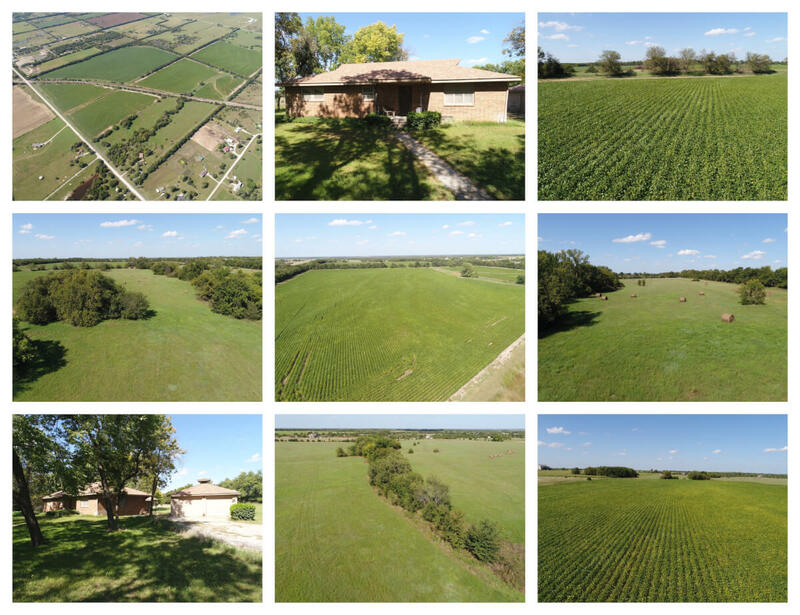 PROPERTY ADDRESS: 13274 SW 160th St, Rose Hill, Kansas. 2017 REAL ESTATE TAXES: $4420.24 for both Tracts 1 & 2. PROPERTY DESCRIPTION: 140+- acres of tillable, native hay meadow, and timber. Great property to own with a nice combination of Agriculture and Recreation. LEGAL DESCRIPTION: The West Half of the Southeast Quarter of Section 22, Township 28 South, Range 3 East of the 6th P.M., Butler County, Kansas, and the East Half of the Southwest Quarter of Section 22, Township 28 South, Range 3 East of the 6th P.M., Butler County, Kansas EXCEPT Tract 1. PROPERTY DESCRIPTION: 79+- acres with a nice combination of tillable ground currently planted to soybeans, native hay meadow, and timber. Great property to consider if you are looking for an income producing agriculture property with hunting or a future home building site. LEGAL DESCRIPTION: The West Half of the Southeast Quarter, except one acre in square form being the Southwest corner of the Southeast Quarter, Section 23, Township 28 South, Range 3 East of the 6th P.M., Butler County, Kansas. 2017 REAL ESTATE TAXES: $568.22. TERMS: Earnest money is specified above and due at the conclusion of the Auction with the balance due upon Sellers submission of merchantable title and closing. Closing date shall be on or before December 3, 2018. Closing fee and title Insurance fee will be split 50/50 between Seller and Buyer. Selling subject to easements, restrictions, roadways and rights of way. This property is not selling subject to financing or inspections. Interested buyers need to view the property prior to the date of the auction and have financing available and any inspections performed prior to bidding. All pertinent information is available upon request. All announcements made the day of the auction take precedence over any other announcements or printed material.